Associate Professor, Department of Periodontics, Faculty of Dentistry, University of Toronto. 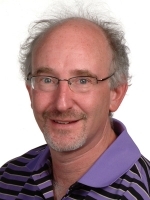 Michael Goldberg is an Associate professor in department of periodontics at University of Toronto.He has completed his graduation,M.Sc Pharmacology and D.D.S. in 1986,1987,1991 respectively from the University of Toronto. Periodontics, Periodontal Health, Diagnosis and Management of Chronic Orofacial Pain, Refractory Periodontal Disease, Peri-implant diseases, Assessment of the interaction between oral diseases and systemic diseases.